We all wash our face twice a day, but how often do you wash your makeup brushes? We all know too well that using dirty makeup tools is bad for your skin. If you love good quality makeup, you have probably invested in a set of high quality, expensive makeup brushes. You might be worried that too frequent cleaning might damage them. Quite the opposite. Regular cleaning will not only make your brushes last longer but is also necessary to maintain healthy-looking skin. How to clean your brushes? It’s easy. Your foundation, powder, blush, lipstick and eye shadow brushes accumulate dirt, oil and makeup residue on the bristles and are perfect place for the bacteria build-up. 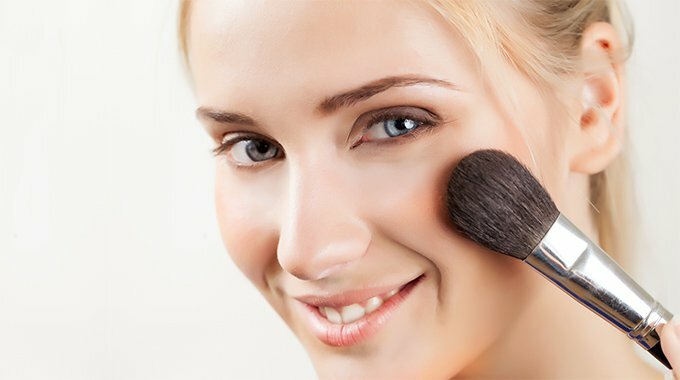 When you apply foundation or powder to your face, you are picking up bacteria from your skin, and they are transferred back to the brush after use. The next time you use the brush the bacteria from the brush are again transferred onto your skin. It is indeed a vicious circle. Using dirty brushes may lead to clogged pores, breakouts, acne, or even conjunctivitis. Regular cleaning will help keep bacteria off your face and will also help maintain your brushes in good condition. 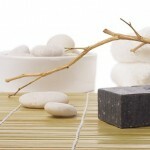 We recommend you wash your brushes every two weeks or more often if you use them a lot. However, liquid makeup brushes and lips brushes should be cleaned immediately after use. If they are synthetic brushes, use hand sanitizer on them after each use. You should definitely wash your brushes when they are no longer soft, and if the makeup residue is cakey and visible. Dampen the brush bristles under lukewarm water. Make sure you do not wet the handle or the ferrule (the area where the handle meets the head). If water gets inside, it can loosen the glue that holds the bristles together causing them to fall out. To avoid that keep the bristles pointing downwards during the entire cleaning process. You can use a variety of products to clean your makeup tools: unscented bar soap, baby soap, antibacterial face wash or a gentle shampoo. Dispense the product into the palm of your hand. When you wash the brush make sure to be gentle so as not to change its shape. Work out the dirt and oil that have been trapped in the bristles. Rinse well under lukewarm water and wash again. Squeeze the excess water out of the brush. If the released water is still dirty, repeat the process. When the water runs clear, you can be sure the brush is squeaky clean. Dry it gently with a paper towel. 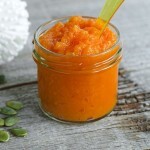 For very dirty brushes try the beauty bloggers trick: add a drop of almond, olive or tea tree oil. Oil will help you break down and remove all the makeup residue from the bristles. Rinse the brush as usual. Lay your clean brushes on a flat towel or a drying rack. Do not leave them in standing position as the water may run down into the handles and cause rust. It is best to leave them near a heater or air-conditioning, if possible. The brushes will be dry overnight and you will be able to enjoy doing your makeup again, bacteria free! 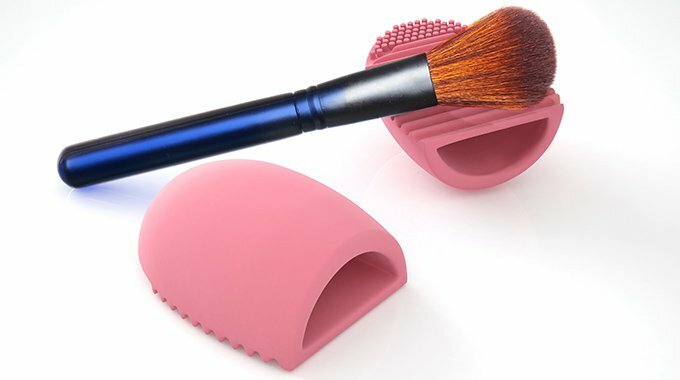 If you are into makeup gadgets, try the latest hit among beauty bloggers: silicone brush cleaners which are specially designed for cleaning brushes. 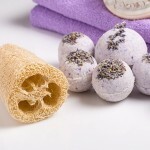 They come in various forms, shapes and sizes: cleansing matts, pads or tool finger gloves. Most of them feature dense silicone bobbles on one end and thick silicone ribs running across the tool. The clever ridged design is perfect for banishing dirt and makeup residue and maintaining the shape of your makeup brushes. 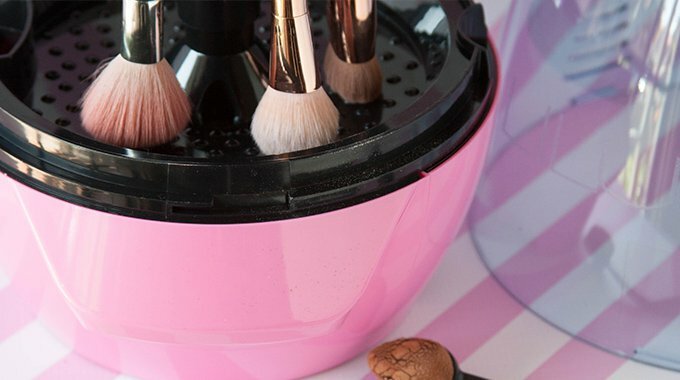 Washing your brushes have never been easier! All you have to do is to pop on your finger into the silicone glove, add shampoo or soap and brush away. Have you tried silicone brush cleanser?